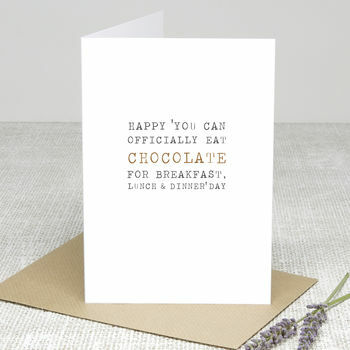 Our 'Chocolate For Breakfast' Birthday card is the perfect way to send your best wishes to the chocoholic in your life. This card reads: 'Happy 'you can officially eat chocolate for breakfast, lunch & dinner' day'. Chocolate is picked out in a lovely chocolatey brown. This card could be sent as a calorie free alternative to buying chocolate or maybe with some pennies enclosed so that the recipient can buy their own treats or just with a huge box of choccies!